Born in Mexico City, Tasnim awakened to the inner life of spirit in her late teens and early twenties. She was initiated into the way of the Sufis by Hazrat Pir Vilayat Inayat Khan in June 1971 and serves the Sufi Order International as a Representative and Center Leader, a Healing Conductor, and as a minister (cherag) of the Universal Worship. Rev. Tasnim was ordained by Pir Vilayat as a Siraj in November 2000. This ordination enables and authorizes her to train and to ordain new ministers of the Universal Worship. In 1982 she met Saadi Neil Douglas-Klotz and together they began to teach and train people interested in the Dances of Universal Peace. 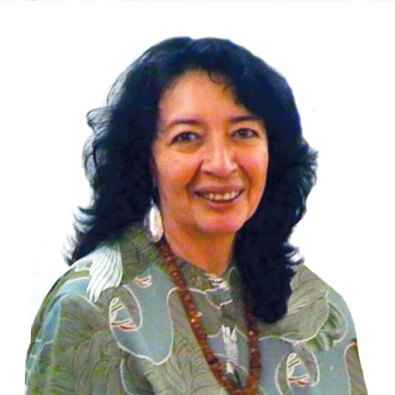 Over the years, her journey of inquiry and discovery led her to study and participate in Hermetics, Alchemy, Vedanta, Kundalini Yoga, Judaism, Tibetan Buddhism, Huichol Shamanism, Mystical Christianity, Hinduism, Islam, Jungian psychology and what has become a lifelong immersion in the sacred literature of world religions and mystical traditions. All of this exposure to the variety of forms taken on by Holy Wisdom only helped to deepen her commitment and appreciation of the universal message of Sufism as brought to The West by Hazrat Inayat Khan. In 1982 she met Saadi Neil Douglas-Klotz and together they began to teach and train people interested in the Dances of Universal Peace. They incorporated the Center for the Dances of Universal Peace and the growth of the work of spreading the Dances, Walks, and teachings of their founder, Murshid Samuel L. Lewis, really took hold. The growth was beyond expectations! There are now over 400 dance circles in many countries. Saadi and Tasnim installed the Certification Guidelines and gave guidance and direction to this quickly blossoming spiritual activity that invites everyone to “eat, dance, and pray together”. From its humble beginnings the organization has now become PeaceWorks – the International Network for the Dances of Universal Peace, INDUP. She is the spiritual director of the Church of All in Burbank. Tasnim gives personal guidance to her Sufi mureeds, trains and certifies Dance leaders, trains and ordains Universal Worship ministers, conducts seminars, workshops, and camps and is a presenter at conferences and festivals. She is also a trained semazen – whirling dervish – in the Mevlevi Sufi tradition.